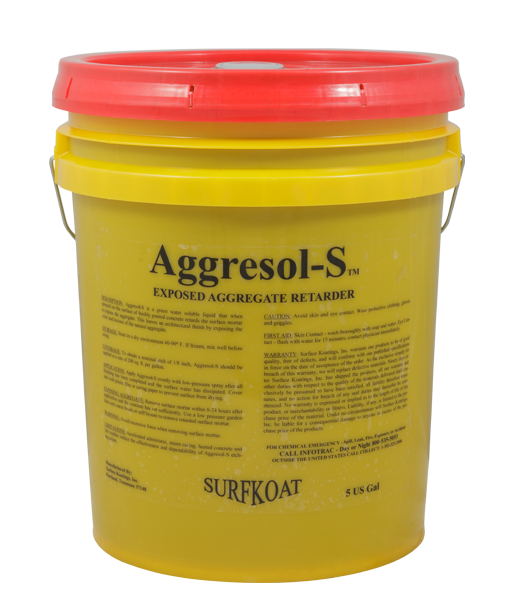 Aggresol-S is a water soluble liquid specially formulated to set the surface mortar of fresh concrete to expose aggregates in freshly placed concrete surfaces. Aggresol-S is green in color to allow for easy identification of applied areas and to ensure appropriate uniform coverage. Aggresol-S should be used to acheive architectural color, texture, and appearance without mechanical means such as sandblasting. Aggresol-F is a water soluble paste specially formulated to set the surface mortar of fresh concrete to expose aggregates in freshly placed concrete surfaces such as steps. 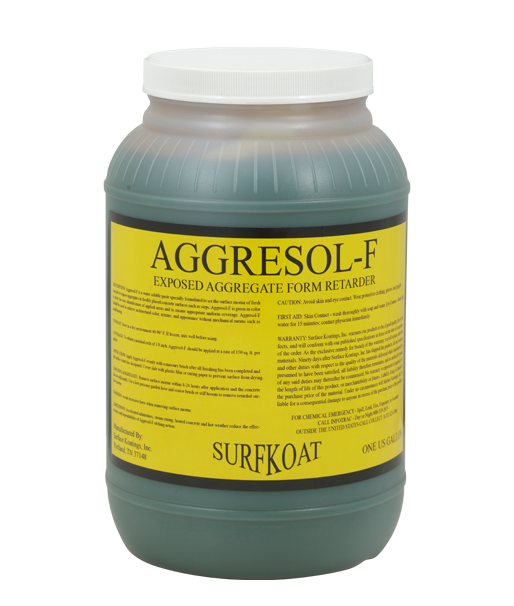 Aggresol-F is green in color to allow for easy identification of applied areas and to ensure appropriate uniform coverage. Aggresol-F should be used to acheive architectural color, texture, and appearance without mechanical means such as sandblasting. Aggreseal Supreme brown is intended for use on exposed pea gravel aggregate concrete. Gray tinted Aggreseal Supreme is intended for exposed limestone chip aggregate concrete only. Apply brown or gray tinted sealer to other forms of concrete may result in unpleasant streaking. Surface Aid is made up of a strong blend of aromatic and ketone solvents and surfactants. It is used to restore heavily coated existing solvent based acrylic sealers that have started to soften, fade, peel, crack, delaminate, and deteriorate. Surface Aid also clears up white spots or blushing due to moisture content issues. Surface Aid melts the heavily coated existing solvent based acrylic sealer, and helps restore the original appearance without adding more acrylic to allow the sealer to wear off naturally over time without stripping the existing bulk of the coating.